As is often the case with perfumers and their creations, I started enjoying the fragrances created by Sonia Constant before I knew she was the creative force behind them. One of those fragrances would be Narciso Rodriguez Fleur Musc EDP, with its lush take on rose and musk, which she co-created with Calice Becker. Another would be the sensual overload of Tom Ford Noir Extreme. Sonia Constant also created Noir Pour Femme EDP, Ombre Leather 16 EDP and Orchid Soleil EDP for Tom Ford. And let’s not forget Narciso Rodriguez For Him Bleu Noir EDT. With its sophisticated spicy, woody and musk facets, it’s one of the best men’s designer fragrances in recent years, methinks. Sonia Constant studied perfumery at the Institut Supérieur International du Parfum, the school founded by Jean-Jacques Guerlain in Versailles. She did her training at Givaudan and has worked for the company since then. PORTRAITS OF SONIA CONSTANT COURTESY OF BEAUTE PRESTIGE INTERNATIONAL. The first fragrance she created, s.Oliver Sport 1 Female, was launched in 2006. Since then she has notched up an impressive list of achievements. Some of her fragrance highlights include: Coach EDT, Fragonard Etoile EDT, Guerlain Aqua Allegoria Tiare Mimosa EDT, Eau de Lacoste L.12.12 Yellow EDT, Lanvin Eclat d’Arpege Pour Homme EDT, Les Liquides Imaginaires Fortis EDP, Montblanc Emblem EDT, Montblanc Lady Emblem L’Eau EDT and Valentino Donna Noir Absolu EDP. COACH CLASS: Created by Sonia Constant, Coach EDT was launched in 2016. When the EDP version of Narciso Rodriguez Bleu Noir was recently launched in South Africa, I was fortunate enough to bag an email interview with Sonia Constant. This is what she had to say. The smell of my mother. When did you know that you wanted to be a perfumer? When I discovered it was a job! Before that I wanted to become a fashion designer or an architect. I also wanted to become a ballet dancer when I was a child. What are the most important things you learned when studying perfumery? That you learn something every day. You never stop learning in this job, as logic doesn’t apply in perfumery. Also that it takes a lot of work to find the right balance and the perfect aesthetic. It’s also important to learn when to stop, to understand when your fragrance is finished. SPARKLING: Launched in 2017, Montblanc Lady Emblem L’Eau EDT is one of many fragrances created by Sonia Constant. How important are trends for you when creating a perfume? I think, as a creator, it is important to create the trend. I am not a follower, but more of a trendsetter. Sometimes, though, it is better and easier to follow trends, as the consumer is by nature reluctant to smell new things. You created Narciso Rodriguez Bleu Noir EDT. How does the EDP version differ from the EDT? We wanted to create a stronger, but fresher version – a technical challenge! I added some clary sage and made the fragrance more fluid, more watery, in a long-lasting freshness. The wood is more vibrant and gives more verticality to the fragrance. It’s also more ambery, with some cistus facets. I brought a new quality of citrus on top of the fragrance and played with our new extraordinary Integrale Bergamote ORPUR. NATURAL ELEGANCE: Narciso Rodriguez For Him Bleu Noir EDP has a fresher quality than Narciso Rodriguez For Him Bleu Noir EDT. I wanted to create a male fragrance that’s irresistible, but not following trends. Nothing fruity, gourmand or fougère. Just a very elegant woody-spicy-citrus fragrance using the best natural components. How long did it take you to create Narciso Rodriguez Bleu Noir EDP? This is the fourth fragrance you have created for Narciso Rodriguez. What is it about the Narciso Rodriguez brand that you like? I love Mr Rodriguez very much. He’s so talented and it’s an honour for me to work for him. He takes part in the development of the fragrances and has a very clear vison. A Narciso Rodriguez fragrance has a very distinctive signature – musk is very important. Narciso Rodriguez fragrances are very different from other perfumes, because they are completely off trend. I love the dresses he designs because of the way they are cut. Simple and elegant. His dresses are intemporelle, like his fragrances. IMAGE OF NARCISO RODRIGUEZ COURTESY OF BEAUTE PRESTIGE INTERNATIONAL. How closely did you work with Narciso Rodriguez on these perfumes? Mr Rodriguez smells the fragrance several times during development, but not at all stages of development. I also work very closely with the Shiseido team, who know his taste perfectly. Mr Rodriguez is very consistent in what he likes. What’s next for Sonia Constant? I have just signed Santal Musc EDP and Narciso Rouge EDP for Narciso Rodriguez, Valentino Donna Rosa Verde EDT and Cerruti 1881 Essentiel EDT. I have also launched my own brand, Ella K Parfums, with a line of seven fragrances based on my travel memories. They are an ode to adventure in all its forms, capturing fleeting moments. Ella K is about looking at the world in a new way. Narciso Rodriguez Bleu Noir EDP, R1 115 for 50ml and R1 345 for 100ml. Narciso Rodriguez Santal Musc EDP, R2 380 for 100ml. My eyes have been taking a lot of strain recently. Not because I have been spending way too much time catching up on social media on my phone. It’s because I have been spending more time than usual reading the ultra-fine print on grooming and beauty products to see if they contain microbeads that are harmful to the environment. The past few years have seen an upsurge in awareness about the huge impact plastics are having on aquatic ecosystems. A lot of this damage is visible to the eye. But smaller pieces of plastic (microbeads or micro-plastics) are also contributing to the problem. ALL CLEAR: Do your toiletries pass the microbeads test? In 2015, the US banned the use of microbeads in products. The UK followed suit in early 2018. 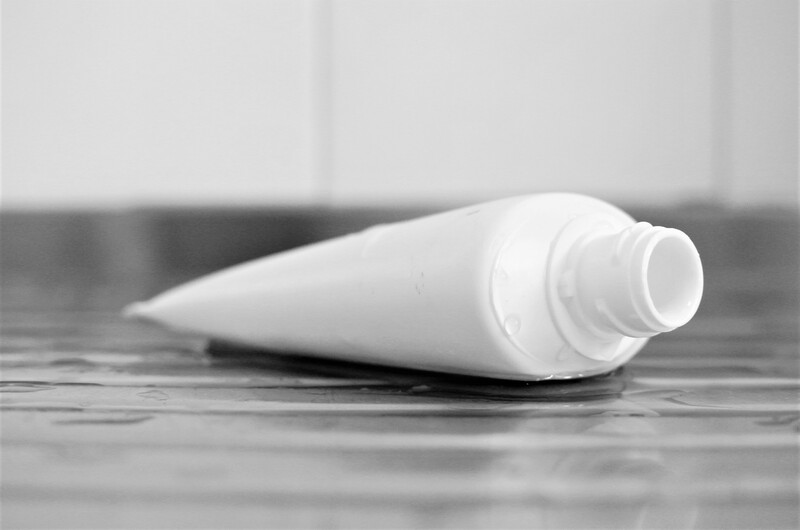 Most recently, I read that South Africa’s Department of Environmental Affairs is in talks with the cosmetics industry about phasing out these plastics: https://www.businesslive.co.za/bd/national/2018-05-18-state-gets-tough-on-toiletry-plastics/. SPOT THE MICROBEADS: These tiny pieces of plastic are found in a variety of products. Image courtesy of the International Ocean Institute – Southern Africa. I asked Dr Shannon Hampton, project co-ordinator of the International Ocean Institute – Southern Africa some questions about the environmental impact of microbeads. Micro-plastics are any pieces of plastic that are less than 1mm in size. Some of them are visible to the human eye, but no less of a problem because of it. They are used to increase abrasiveness, add shine or sparkle. 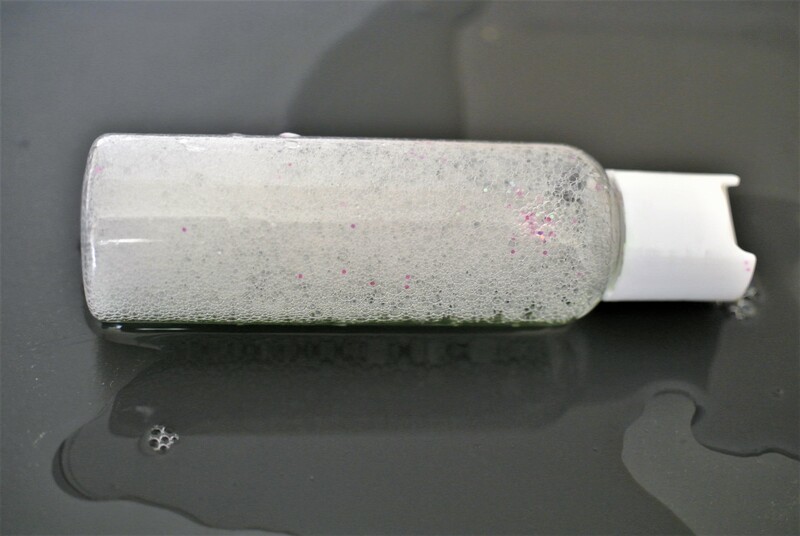 TAKE A CLOSER LOOK: Microbeads in shampoo. Which products are they found in? Shampoos, soaps, toothpastes, body scrubs, facial scrubs, cleaning products, washing powder, make-up and body lotions. Most glitter is plastic. ALL THAT GLITTERS: So pretty, yet so toxic. Why are microbeads so harmful? Micro-plastics are very difficult and expensive to filter out from waste water. Once they are in the environment, there is little that can be done to recover them. They contribute to the “plastic soup” that affects all parts of the ocean. The tiny pieces of plastic get mistaken for food by zooplankton and then the zooplankton gets eaten by a small fish. The small fish gets eaten by a big fish, which then gets caught by a fisherman and lands on your plate, plastic included. The micro-plastics get scooped up in the gaping mouths of whales or filtered through the gills of mussels and sucked in by anemones. ON THE MENU: Catch of the day infused with microbeads. Image courtesy of the International Ocean Institute – Southern Africa. It won’t surprise you that there is no nutritional value to plastic. But did you know that some of the dyes used are toxic? Not only that, but plastic absorbs toxins like DDT. So the plastic becomes many times more toxic than the water that surrounds it (and this gets in to the meat of the fish that you eat). Earlier this year the UK government banned the use of microbeads in various products. What is the South African government doing to combat this menace? The Department of Environmental Affairs is working with the Department of Health to develop legislation to address the issue of microbeads. How can consumers tell if the grooming or beauty products they are using contain microbeads? Be suspicious of any artificial beads in your products. Microbeads are also used in household cleaning products, which don’t list ingredients. DO YOU KNOW WHAT’S INSIDE YOUR PRODUCT? What can consumers do to bring about change regarding the use of microbeads? You can avoid all products with micro-plastics. Contact retailers and manufacturers asking them to no longer use them. The more people who actively choose to not buy products because of microbeads, the more pressure there will be on manufacturers to stop producing these products. There are natural alternatives, so there is no need for plastics in our personal care products. Create awareness by talking about the issue with your friends and family. Contacting manufacturers and retailers on social media and directly can help them realise that there is public pressure to change their ways. There is also a petition: https://www.change.org/p/ban-microbeads-in-south-africa?recruiter=69869968&utm_source=share_petition&utm_medium=facebook&utm_campaign=share_petition&utm_term=des-lg-no_src-custom_msg. We have written about some of this on our website: http://ioisa.org/2015/09/01/ioi-sa-becomes-a-beat-the-microbead-partner/ and my blog: http://howtosurvivephd.blogspot.com/2015/08/taking-pollution-down-to-zero-become.html. I was recently invited to eat a meal at Arbour Café, a French-style cafe in Birdhaven, a wealthy Johannesburg suburb. I am usually weary of French-inspired restaurants, as all too often they lapse into tweeness and clichés. Non, merci beaucoup! However, in the name of open-mindedness, I put my misgivings aside and accepted the kind invitation. And besides I needed an outing to wear my Terre d’Hermes Parfum. I arrived for my Arbour Café rendezvous for an early-ish brunch. While the street-facing side of the restaurant has its attractions, I chose to eat in the courtyard for a bit of air, sun and people-watching. Arbour Café specialises in galettes (savoury French buckwheat pancakes) and crêpes (thinner pancakes usually served with sweeter fillings). There are plenty of other options on the menu for breakfast, dinner and lunch, including omelettes, salads, sandwiches and desserts. TRES BIEN: Galette with Smoked Norwegian Salmon, Capers, Cucumber, Dill Crème Fraîche and an Egg. For my main meal, I chose the Galette with Smoked Norwegian Salmon, Capers, Cucumber, Dill Crème Fraîche and an Egg. Très bien! And the Decadent Nutella and Banana crêpes for dessert. C’est délicieux! Both were served by friendly and attentive staff in an amiable and comfortable environment that’s thankfully not precious at all. C’EST DELICIEUX: Decadent Nutella and Banana crêpes. 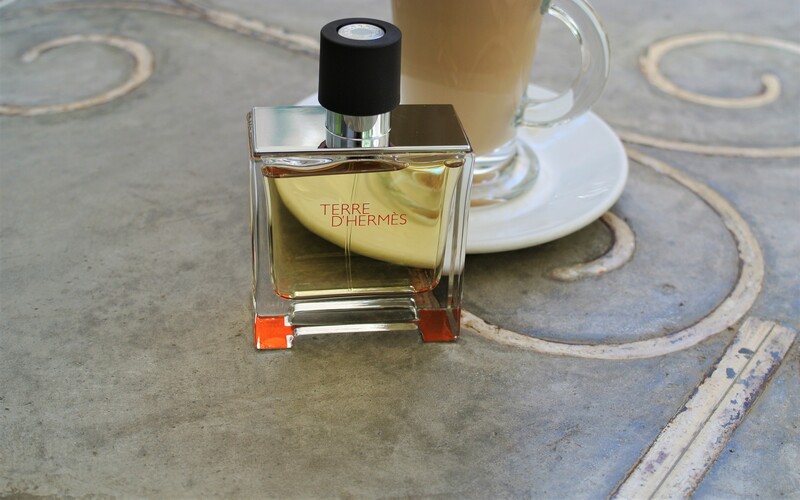 Yet there’s so more to Terre d’Hermes Parfum than its trademark citrus introduction. Its flint note adds an unusual and earthy mineral aspect, which evolves into an almost burnt treatment of oakmoss, woody and benzoin notes. Not for nothing is Terre d’Hermes Parfum regarded as one of perfumer Jean-Claude Ellena’s masterpieces.